Product prices and availability are accurate as of 2019-04-18 01:30:50 EDT and are subject to change. Any price and availability information displayed on http://www.amazon.com/ at the time of purchase will apply to the purchase of this product. In this Learning Windows PowerShell training course, expert author Mark Long will teach you how to use this task-based command-line shell and scripting language, built on the .NET framework, designed especially for systems administration. This course is designed for the absolute beginner, meaning no prior experience with Windows PowerShell is needed. 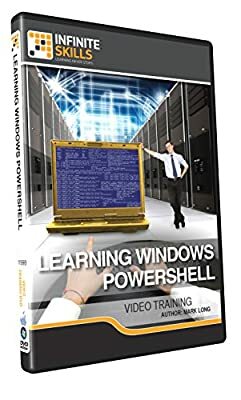 You will start by learning the basics of PowerShell, then jump into installing and setting up PowerShell. From there, Mark will teach you the PowerShell commands, including objects and classes, get-help, and get-command. You will also learn about PowerShell scripts and providers, such as the file system provider, alias provider, and environment provider. This video tutorial will also cover working with files and folders, system administration, and PowerShell version 5. Once you have completed this computer based training course, you will be fully capable of using Windows PowerShell for your administrative needs. Working files are included, allowing you to follow along with the author throughout the lessons.